It has been invaluable. I began my studies wanting to know something about Carmel and not sure what I should broach. The past six years with CIBI has been so valuable, allowing me to broaden by knowledge as a complement to the formation I received as a member of the OCDS. The module units I have undertaken from the Certificate, Diploma and at master’s levels, have all been challenging and well-presented and taught me so much about the spirituality, history and saints of Carmel. It has been a privilege to study with people who have so much to offer and who provided me with insightful feedback. A Brisbane student. 26th October 2018. A United Kingdom Student. January 2018. A South African Student. January 2018. As a member of the Carmelite family, I have just completed my Diploma in Carmelite Studies with the Carmelite Institute of Britain and Ireland. I did the Diploma on a part time basis over a six year period (with a little extension!) while working full time for the Carmelite Order in the British Province as the Provincial’s Delegate to the Third Order. I enjoyed the course tremendously and it has been invaluable as part of my Carmelite formation and helped me to grow in my knowledge of the Order and its Charism. For sure there were times when I found it a real struggle to find the time to engage with the assignments due to the, at times, heavy demands of full time job and supporting a young family. However, due to the way the on-line distance learning course is structured, with very supportive tutors – flexible in their approach, I managed to complete the course. At times when engaging with the modules, e.g. doing the background reading of recommended material and making notes etc. it felt like I was taken to another place, so prayerful and peaceful was it! Reading and reflecting on the material, I found frequently led into prayer and also helped me reflect on how God has been at work in my own life situation, past and present! I also found at times that I would get little insights into the experiences of the saint I was studying, sharing in their thoughts and experiences. Having had the opportunity to do the CIBI course was without doubt a great blessing! A member of the Carmelite Family. United Kingdom. 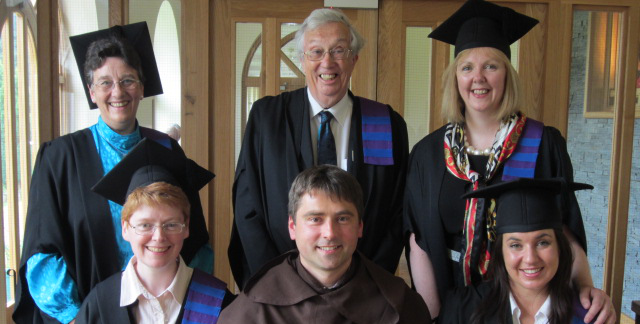 At the end of 2013, three Sisters of the Carmelite Monastery in Dysart completed the Course for the Diploma in Carmelite Studies, offered by the Carmelite Institute of Great Britain and Ireland. One felt that, after several decades in Carmel, it was a good time to take stock: to deepen our understanding of our vocation and of the rich heritage bequeathed to our Order by those who have gone before. Another, having enjoyed studying before entering Carmel, relished the opportunity to study once again, and with the added bonus of learning more about the Carmelite charism of both branches of the order. The third felt that the completion of the diploma course would be an achievement as this level of study was new to her. She also enjoyed the variety of modules, all based on aspects of our Carmelite life. The entire Course includes studies on the history of our Order, the riches of the spirituality associated with it and the life and teaching of some of the saints of Carmel. Being very different from one another, we each had our preferred kind of module, while enjoying the whole study, and found mutual support in one another’s company. Little asides such as: “Have you done your questionnaire yet?” or “Have you had your Tutor’s comments?” helped us to feel that we were not alone, and we could offer ready sympathy to anyone who was struggling to meet the deadline. The material contained in each module was a rich source of learning, while the written assignments served as a challenge that kept us focused. The comments of the Tutors, as well as the marks awarded, were a useful indication of our progress. The material itself is not new to those who have spent many years in Carmelite formation, but it does provide a fresh look and inspire a new evaluation of our vocation and our beautiful heritage. We can imagine that a non-Carmelite would find her/himself entering a new world of unsuspected treasures of spiritual and historical significance. This course seems especially helpful for anyone involved in initial formation, and the Adult Education course could be helpful for the novices themselves as an introduction to Carmel. Because of our experience, we were asked to lead the community sharing and discussions of the writings of St. Teresa of Avila, in preparation for the Centenary of her birth in 2015. We now look forward to receiving our Diplomas, and hopefully meeting some of those who have helped us on our way, such as the Director of Studies, the Administrator and the Tutors. Sisters Agnes, Josephine and Margaret. Scotland. Having now completed the Diploma in Carmelite Studies, I could look back on those five years of on-line learning with both relief and relish. Though much of learning has come from reading and reflecting on the notes provided, it has amounted to a wealth of learning benefitting both formation and community-life in my Secular Carmelite activities and responsibilities. The course modules fulfilled both academic and formative expectations. I have found in them depth and substance, reflective of the scholarly effort of the module authors and tutors. A particular tutor in assessing my essay has given me such insightful comments as to better present for coherency and quality of work. In my learning process, I found the on-line delivery of and the content of the modules to be very well structured and user-friendly. While awaiting the clock-work release of the module reading and questionnaires, my anticipation heightened with tackling each block of units and questionnaire. Each essay assignment had its exciting moments when sourcing ideas and support literature, at times including drawing upon personal and communal life experiences. When at last the tutor’s comments were sighted, the tension gave way to an overwhelming sense of fulfilment and reward! Along the way, I have built up a collection of the module notes and secondary reading, neatly numbered and filed. Already, this accumulation is proving to be a great resource for formation work in my OCDS Malaysia Communities. My online studying with the Carmelite Institute of Britain and Ireland was truly a memorable journey. As a Third Order Secular Carmelite, I began this journey in 2009 in hopes of deepening my knowledge in Carmelite studies. Studying online with CIBI gave me the opportunity to explore in more detail the history of our Carmelite Family. At first, I was intimidated by the idea of an online course, but I can confidently say this was an amazing learning experience. The CIBI team was extremely helpful throughout my studies in developing my understanding and promoting my spiritual growth. I value the opportunity to study online because it provided me with a structured way of learning about Carmel’s rich heritage, charism and spirituality in the comfort of my home. Personally, this experience has given me the ability to confidently speak to others about the lives of the Carmelite saints and to spread the history of the Carmelite Order. In reflecting on my experience with CIBI, I am certain that I will continue my studies by pursuing my Master’s degree online. I am very thankful for the guidance of my coordinator and tutors, which made my experience at CIBI a truly positive one.